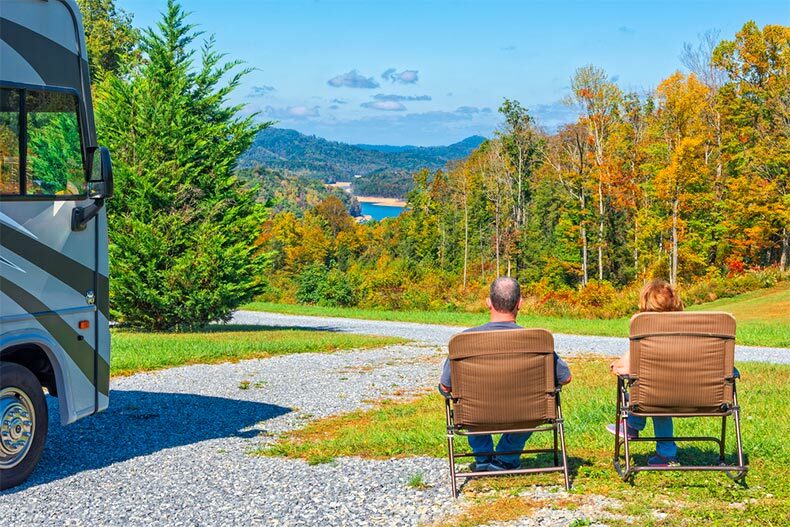 Living in a 55+ community with an RV has its rewards, including views like these. Active adults who dream of traveling and exploring different places often hop behind the wheel of their recreational vehicle (RV). Climbing aboard and cruising the open road allows active adults to embrace life at their own pace, whether they’re embarking on a cross-country journey, tailgating at sporting events, getting away for the weekend, or spending time outdoors. Kampgrounds of America reports that 75 million households around the country actively camp. In 2016, overnight visits in tents or RVs hit a 20-year high, according to National Parks Service. Many RV owners even call their RV home, at least for an extended period of time. The Recreation Vehicle Industry Association estimates that between 100,000 and 200,000 people make their RV their home. However, you don’t need to give up the luxury of your own home to make the most of an RV lifestyle. You just need to know the answers to some common questions, such as, “Can I park my RV in a 55+ community?” and “Are there RV-friendly active adult communities?” Read on for our overview of RVs in 55+ communities. Can I Park My RV in an Active Adult Community? Whether you own an RV or you’re thinking about buying one, you need a place to park it when you’re not on the road. Active adults with a passion for RVing should know that there are many 55+ communities with RV garages, making it easy to live in your dream home with your RV right on your property. These RV-friendly active adult communities are all over the country, from Heritage at Cadence in Henderson, Nevada, to Highland Lakes in Leesburg, Florida. By parking your RV at your home, you know that it’s safe when it’s not in use and you can take it when you need it. You don’t have to worry about picking it up or dropping it off somewhere. If you desire the ease and cost savings of parking your RV in your active adult community, do some research into your preferred 55+ neighborhoods. You might be surprised at how many offer RV parking options. Are There RV-Friendly 55+ Communities? Plenty of 55+ communities make it easy for residents to life an RV lifestyle. Many active adults find themselves wondering where they can find an RV-friendly 55+ community. The best place to start is 55places.com. Under the amenities tab, you can select “RV/boat parking” and browse a list of 55+ communities you might like. When you find an interesting community, just click the “Request Sales Info” button or take look at the "Homes for Sale" tab to send an inquiry. Many active active communities feature RV parking along with an appealing array of amenities, such as state-of-the-art fitness centers and resort-style pools. For example, Traditions at Desert Creek in Green Valley, Arizona, offers residents RV parking plus access to dance studios, computer labs, fishing lakes, and more. The good news for RV enthusiasts is that they can find an abundance of RV-friendly communities all over the United States. What’s It Like Living in a 55+ Community With an RV? Many active adults aren’t sure what to expect when they move to an active lifestyle community with an RV. They’re not sure how and where to park their RV, and if RV parking is even allowed. By taking some time to research where you want to live and by focusing on communities that offer RV parking, you can set yourself up for the most happiness with an RV lifestyle. Some things to look out for while searching is if the community is low-maintenance, lock-and-leave, or has an RV club. All three can make the transition to a community easier. Ultimately, when you choose an RV-friendly 55+ community, the world is your oyster. You can come and go as you please and know that you’re in good company with neighbors who also appreciate the excitement of RV travel. 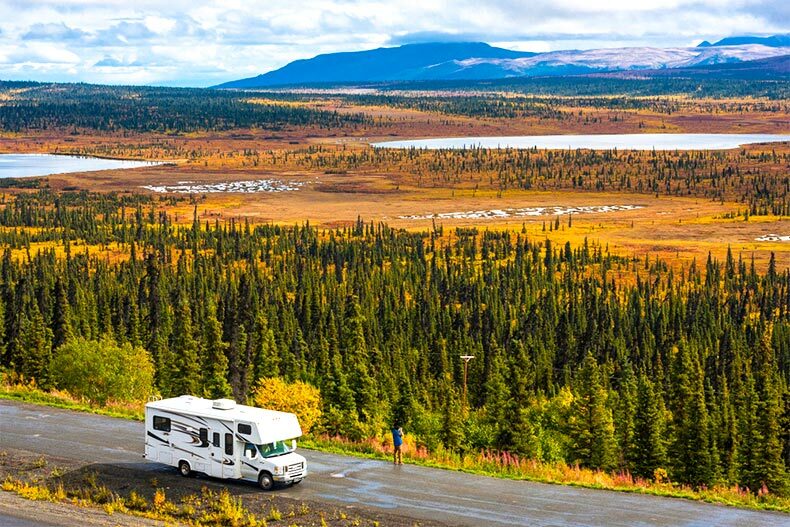 With an RV, you can enjoy the adventure of a lifetime, traveling wherever and whenever you wish. The RV lifestyle is also ideal for building relationships. When you live in an RV-friendly 55+ community, it makes the adventure that much more fun. Take a look at age-restricted communities that welcome RVs on 55places.com.